The color is by LM Schofield in walnut. What style is this brick? Try Old Carolina Brick Savannah Grey. It's the closest I could find to this brick & it's beautiful. They have handmade brick & brick veneer that is absolutely beautiful. Many different varieties. I just did my kitchen in the Savannah grey veneer. 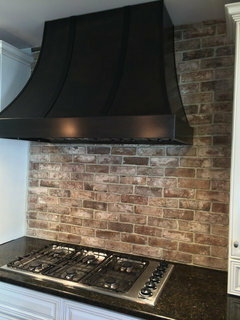 Savannah Grey thin brick installed on kitchen back splash. Where can I get info. On the column in this photo ? You can fine similar columns here http://certifiedhardwoods.com/products/100-recycled-rosewood-columns/ These are reclaimed Solid Rosewood from southeast asia. 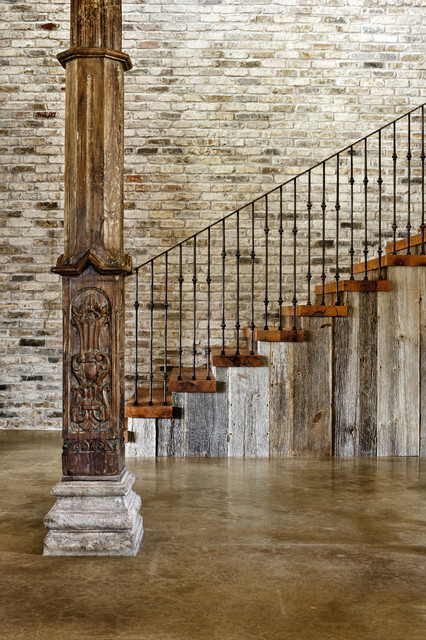 Beautiful use of reclaimed bricks! Great job! Will you share the info on this fabulous brick? PLEASE??????? This is a reclaimed brick from an old building in Chicago. It really makes a strong statement! What type of wood was used on the stairs? - What type of wood was used on the stairs? what type of wood did you use for the stair planks? Brick - Where can I get this brick from? What line is it? What is the name of the color batch?